This event took place all the way back in AUGUST, and I’m just now getting around to writing it up! That should say something about how busy the last few months have been, or I guess it could say something about how disorganized I am as well…. I’m going to try and catch up a bunch of entries this week. 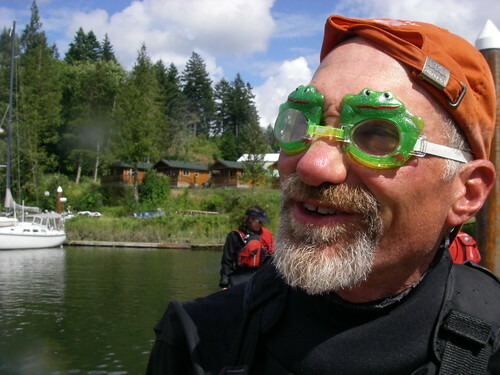 Last year was the first annual Lower Columbia Kayak Roundup ever. It is the brainchild of Ginni Callahan, and it is held on her property, Slow Boat Farm on Puget Island, WA. 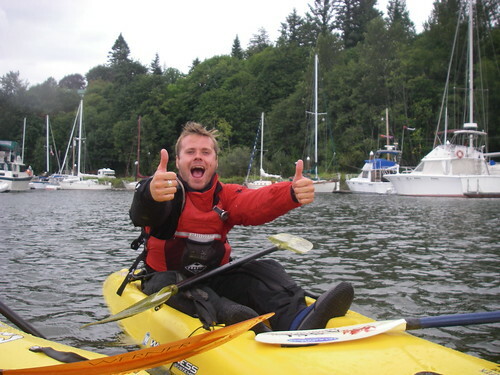 This event combines a BCU skills symposium with a weekend of classes and tours for all levels of kayaking. This year, we were the event where the new BCU standards were rolled out for the West Coast of North America. We had coaches and paddlers from as far away as England, the Netherlands, Denmark and New York. Two coaches were brought over from across the pond for this event, Phil Hadley and Ed Christian. Just so folks don’t get the wrong idea about British BCU guys, here’s Phil hefting a Greenlandic seal hunting harpoon, and Ed, partying down in a sit on top kayak. The week started on Saturday and Sunday with the coach update and fun with canoes. The new BCU 2 star award involves basic competency with canoes, something that had not been required before. 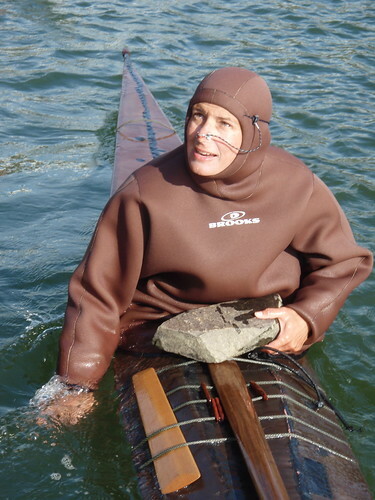 On Monday, I took the Foundation Safety and Rescue Training, which replaced the old Canoe Safety Test. This was a pre-requisite for the level one coach training that would take up the next four days for me and eight of my comrades. We spent some time in the classroom, which was the converted chicken coop at the farm, talking about coaching techniques and cramming our heads full of acronyms of all kinds. 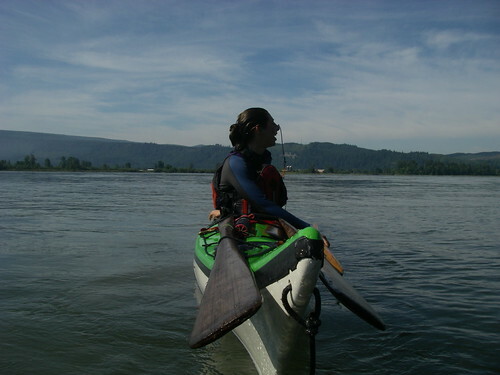 The rest of the time was spent practicing skills, such as using throw bags for rescuing swimmers, playing all kinds of games in kayaks, practicing rescuing various kinds of kayaks, assessing different venues for teaching, and practicing coaching each other in various paddling skills, in all kinds of craft including whitewater kayaks and canoes. On Friday, the last day of our coaching training, we were presented with a half dozen or so real students, recruited from the local clubs and other places, and given the task of running a brief coaching session with them. 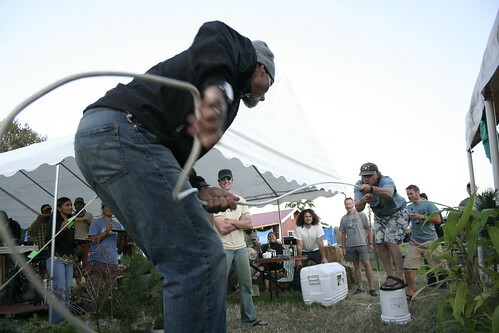 In the evenings we ate fantastic dinners cooked by Dave and others, and played silly games like this one pictured below, where two people stand on upturned buckets and try to pull each other off with a rope strung between them. Phil was pretty much the undisputed champion of this activity. On Saturday, I had a couple of classes to teach, rather than taking them myself. 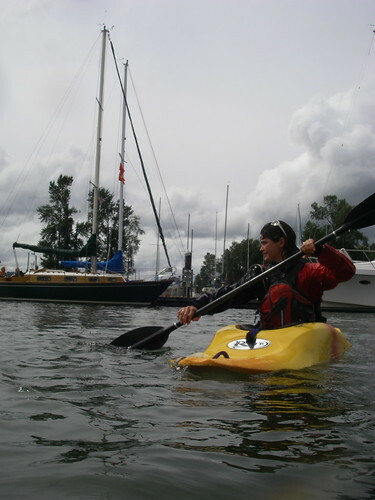 I taught two balance bracing classes, which is the trick of laying on your back on the water, while still in your kayak, to put it as simply as I can. This trick is a gateway to rolling a kayak, and the young lady pictured below was a super fast learner and quickly mastered the balance brace and went on to quickly learn a basic rolling technique as well. 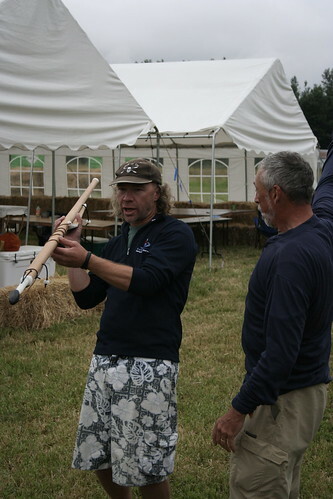 Saturday afternoon, we held the second annual “sticks and stones” Greenland rolling competition. Last year we had five competitors, this year we had seven, including Cheri Perry from the east coast, who pretty much swept the field clean and left most of us in the dust, points-wise. But I moved up a few points from last year and had a couple of new rolls since last year as well. 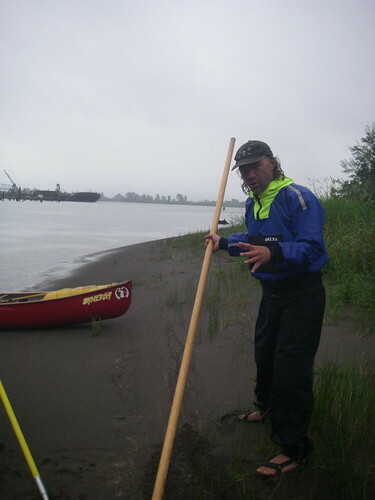 Sunday was the last day of nine days in a row, and I took the opportunity to take a 3 star canoeing class from Phil. 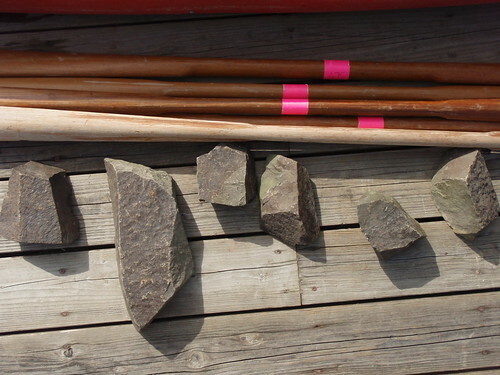 I learned more about canoe handling than I ever would have imagined. All in all, it was a fantastic nine days, and I am already looking forward to next year’s event, August 17-23rd, 2009. Hope to see you there!